New in August 2018, ePoll offers the ability for instructors to mark specific answer prompts as correct and to collect student scores from polls. This is most commonly done when creating complete polls in advance rather than when using the quick polling routine. For Short Text questions, correct answers are entered by inputting the desired text and then clicking the Plus icon. Answers are not case-sensitive and it is possible to enter a number of correct possibilities or variations. 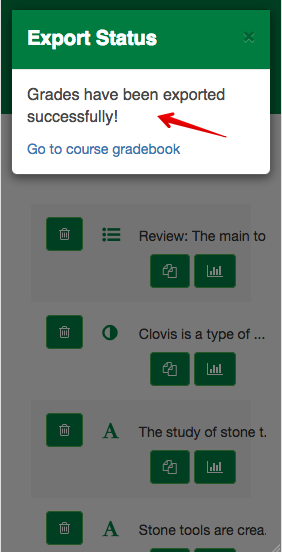 Student correct scores can be pushed directly into an eClass course gradebook. This process will create a new manual grade column in the target course, titled the poll name. Students who have answered any gradeable questions in the poll with poll data will be matched by their CCID and have their total numbers of correct answers entered into the grade column. The column title, maximum score, and any student values can be edited as normal inside the eClass gradebook. Note: this is not a grade synching mechanism - a new column will be added to the gradebook for each export push from ePoll. The results from a poll can also be downloaded as a .csv spreadsheet that includes the full activity from the session. The spreadsheet contains the first name, last name, and CCID of every user who signed into the poll and responded to at least one question. The title of each question launched during the poll is also captured, along with each user's response to that question. In addition, there are summary columns that count the overall responses made by each user and their total of correct answers. In the example, the highlighted column contains the values that would be exported to eClass (described above).